Copper has always been a very essential part of Indian history and has played a major role in the evolution of the culinary art in India. This inspiration is evident in their design which has incorporated the concept of Tamra is a rustic yet elegant manner. Tamra is a multi-cuisine restaurant (European, Indian, Japanese, Chinese and Thai) in Shangri-La Eros Hotel, Ashoka Road, New Delhi, catering to taste buds from all over the world. Ranging from Japanese Teppanyaki and Sushi Bar to a salad bar with a variety of bread, from the grill section to dahibhalla, from dim-sums to ‘Ghar-ka-khana’, Tamra has got it all. The ambience at Tamra, the décor and the hospitable staff live up to the essence of “Atithi Devo Bhava” and yet they have a very global appeal. 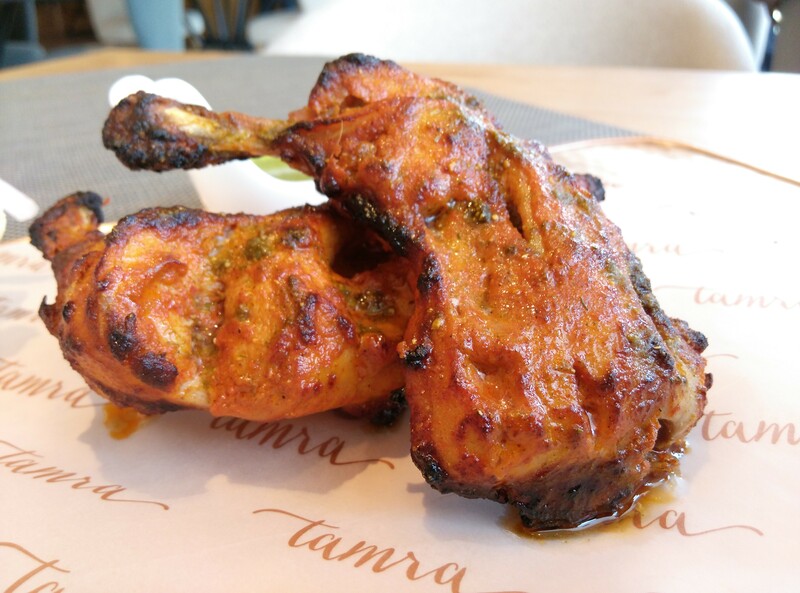 The most unique aspect of Tamra is the scope for customization, where the chefs are ready to cook according to one’s mood and taste. One gets exactly what they are craving for cooked exactly in the manner they want. Thus, bringing a high level of creativity to casual dining along, withan assortment of cuisines from all across the globe, under one roof. Delhi is known for its extreme weather, and with summer just round the corner, refreshing juices and mocktails become a very important part of our meal. Their Big-Wave is an absolute favourite. Though it is a combination of guava, pomegranate, litchi and cranberry juice, the guava is the hero of the drink. The Mango Scream and Asian Lemonade are also quite refreshing, but the best is the Garden of Eden. The pomegranate juice with a dash of raspberry and blueberry puree, lime juice and gingerale is an amazing combination to beat the heat and is absolutely delicious. 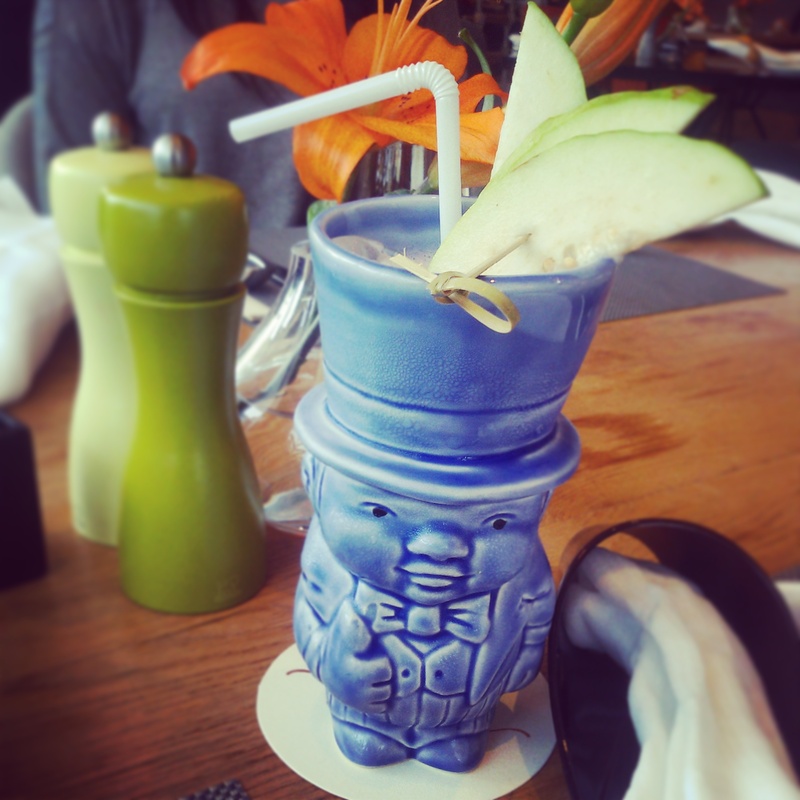 The beautiful Hawaiian- themed mask mugs in which they are served is fascinating! The Sushi Bar at Tamra has a great variety. The vegetarian and non-vegetarian sections are separate, keeping in mind the sentiments of the vegetarians. The sushi is good, but the opinion may vary from person to person. The wasabi, however, is a little too strong. The ginger pickle served with the wasabi and sushi is quite nice. For salmon lovers, the nigiri is quite a delight, where the fish is nice and fresh. The California roll is great. With delicious crab meat and masago, which gives it a great texture, it is a very flavorful mouthful. Tamra has a great Chinese section as well. Their dim-sums are great. 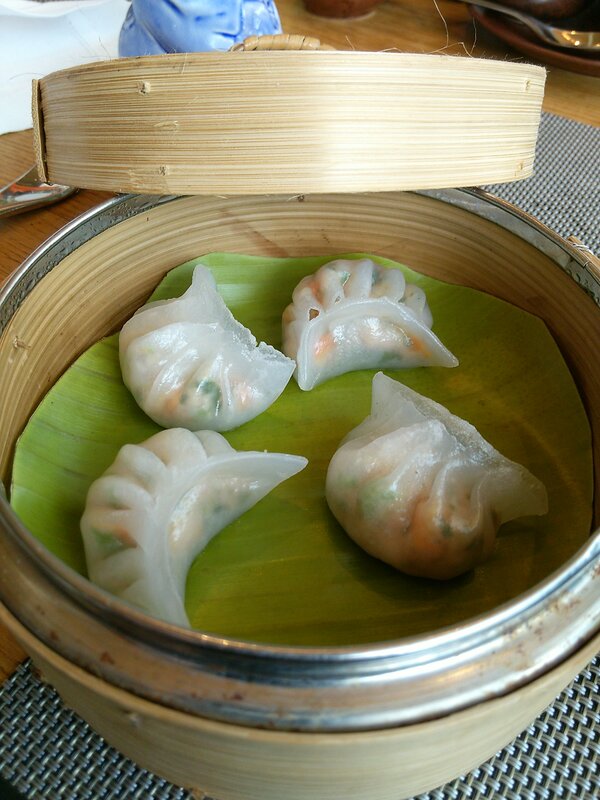 The translucent covering of the dim-sums gives it an aesthetic appeal, inviting one to go and taste the beauty that lies beneath it. The chicken and celery dim-sums are brilliant! The carrot and the celery give it a wonderful texture and compliment the chicken very well. The baby corn dim-sums also taste great. They are both very light and make good starters to a meal. The noodles, the stir-fried vegetable and the vegetables in yellow curry are also nice and worth trying. The Thai chicken croquetta with peanut sauce and French fries is a killer dish! The beautiful lemon grass flavor and a crunchy texture make it an amazing dish and is definitely something one must try at Tamra. Their shredded lamb in black bean sauce is a treat for the taste buds. The fish in Thai herbs and the chicken in massaman curry transports one to the restaurants in Thailand. The perfectly cooked jasmine rice compliments all these dishes very well. As the name suggests, Tamra specializes in Indian food. Beginning with the vegetarian platter, the kebabs are soft and spicy and very tasty. The paneertikka is also a big hit, in which very good quality paneer is cooked very well. The dal makhni is one of their best dishes and is a must-try. Thick, rich and creamy, it is heaven on earth. The kumbhpalak, harabharapaneer, and poriyan (made of cabbage and coconut) are some nice dishes that go well with the masala roti. A very different kind of roti sprinkled and cooked with a variety of indian spices, is an absolute stunner! The kulcha at Tamra is also very good. If one likes rice, the onion corn rice is a very good choice. For the non-vegetarian lovers, the Chicken Chooza is a must-try! Extremely well-marinated, with the correct balance of spices and cooked to perfection, one cannot miss this beauty at Tamra! Other non-vegetarian dishes such as dum chicken, fish curry and roganjosh are also good and worth a try. Something that caught our eye in the menu was the dahi-lahson chutney. Interesting combination of curd and garlic, it has a unique and fresh taste and would have a cooling effect in the hot summer days. Ending on a sweet note, the Tamra chocolate is a must-try for all the chocolate lovers. 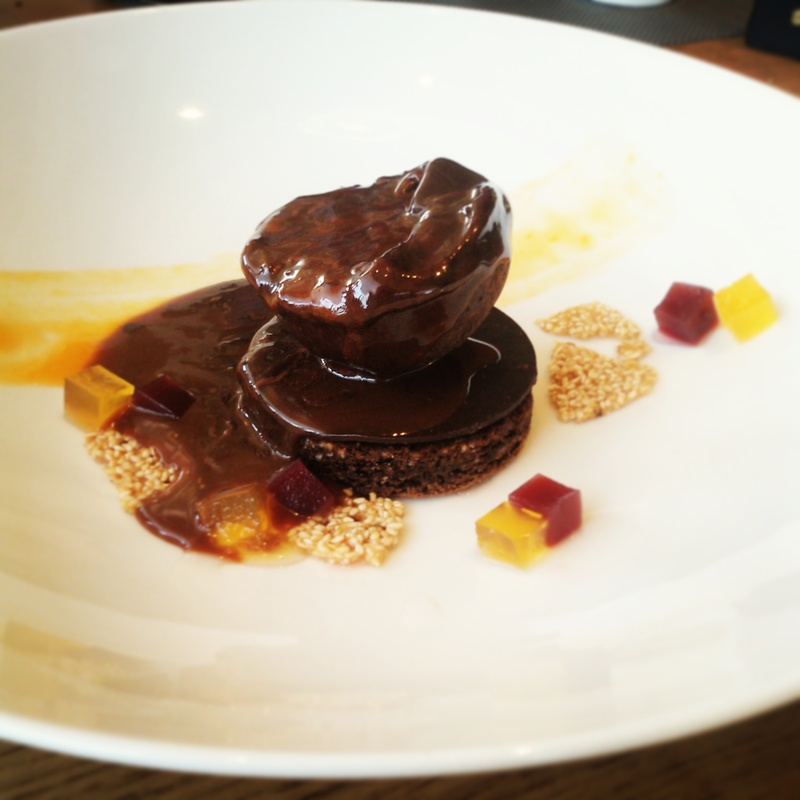 A signature Tamra dish, it has chocolate ice cream, dark chocolate disk and brownie with chocolate syrup. The sesame biscuits and bits of tooty fruity give it a nice crunch and flavor. The overall combination is lethal! Their Pinacolada deconstructed is also another favourite. The slightly sour Teppan-seared pineapple in contrast to the sweet coconut ice cream together forms a perfect mouthful, ending the meal on a perfect note.